Stepping into a management role for the first time is a daunting task for anyone. Most new managers are eager to make their mark as leaders and approach their supervisory opportunity with verve and enthusiasm, yet don’t have a good idea of the nature of managerial work. It doesn’t take long for reality to set in before new managers realize that leading people is a whole new ballgame. What made them successful as individual contributors will not ensure their success as managers. Upon promotion to a supervisory position, all first-time leaders should be issued the New Manager’s Survival Kit. This metaphorical kit includes the basic items a new manager needs to survive the transition from being an individual contributor to a people manager. This kit doesn’t include everything a new manager needs to succeed on the job (see Dan McCarthy’s 25 Tips for New Managers for an excellent list), just a few essential emergency relief items. 1. Compass – To succeed as a manager you need to know where you’re going, and you need to navigate your journey from a couple different perspectives. First, you need to be clear on your own leadership point of view – your values, beliefs, and desires for being a leader – for it is these ideals that will keep you grounded and motivated in your career. Second, you need to understand the path of success from your boss’ perspective. What does success look like in your new role? Make sure you’re clear on your goals and objectives. 2. Mentor – Or more accurately, the contact information for your chosen mentor. Think of it as the “phone a friend” lifeline from the “Who Want’s to be a Millionaire?” TV game show. There will be many times you’ll need to phone a friend to ask for advice, vent, or commiserate with someone who has walked the same path. We all need a sage guide to help us on our leadership journey. 3. Seat cushion – For better or worse, the reality of organizational life is that managers participate in a lot of meetings. When you first move into a supervisory position you might wonder to yourself “What am I going to do with my time now that I’m not on the front lines?” The answer is meetings, meetings, and more meetings. 4. Thermos – Managers frequently work long hours, sometimes at an unrelenting pace. You’ll need a thermos for your coffee to keep you energized and focused, especially when you’re in those meetings, meetings, and more meetings. Did I say that managers have a lot of meetings? 5. Hearing aid – Arguably the most important of the survival kit items, a hearing aid is essential for your success. Listening is one of the most valuable yet underused skills for managers. Through listening you will build trust, establish rapport, learn about your people, and understand what’s truly going on in your business. 6. Tissues – Inevitably you will have someone cry in your office, and occasionally, you may feel like crying yourself! Always have a box of tissues on hand to gracefully handle those emotional moments. 7. Megaphone – One of your primary roles as a manager is to cheer your people on to success. The most difficult transition for new managers is learning how to achieve goals through other people rather than doing it themselves. You’ll need to learn the three P’s of motivating people: Push, Praise, and Play. Some people need to be pushed to perform their best through challenging assignments or strict accountability, while others need to be praised in order to bring out their best work. And of course every manager’s favorite, some people just need to play. Those are the self-motivated individuals that just need to be put in the starting lineup and given the freedom to do their thing. 8. Task list – Whether it’s a productivity app on your smart phone or an old school to-do list, you need a method to keep yourself organized. Managerial work is characterized by brevity, variety, and fragmentation, so you need a way to keep track of all the tasks on your plate. I use a combination of techniques including elements from David Allen’s Getting Things Done philosophy, ABC task prioritization, and Urgent vs. Important analysis. 9. Inspirational reading material – I won’t give you a list of critical books that new managers should read (that’s the subject of a different blog post! ), but I will say that new managers need inspirational reading material to help them learn the skills they need to master as well as to stay inspired on their journey. Leading people requires mental, emotional, and physical stamina and it’s important to make sure you’re feeding your own soul so you’re equipped to give to others. 10. Mirror – Yes, you could use the mirror to help start a campfire or catch the attention of a rescue plane if you’re stranded in the wilderness, but in the office you can use it to look at your reflection, because at the end of the day you have to be comfortable, satisfied, and proud of the person looking back at you. One of the best pieces of advice a new manager can receive is to “be yourself,” for that’s what it means to be authentic. As you experience the highs and lows of leading people, occasionally check yourself out in the mirror to see if you’re being the kind of leader that you’d like to follow. 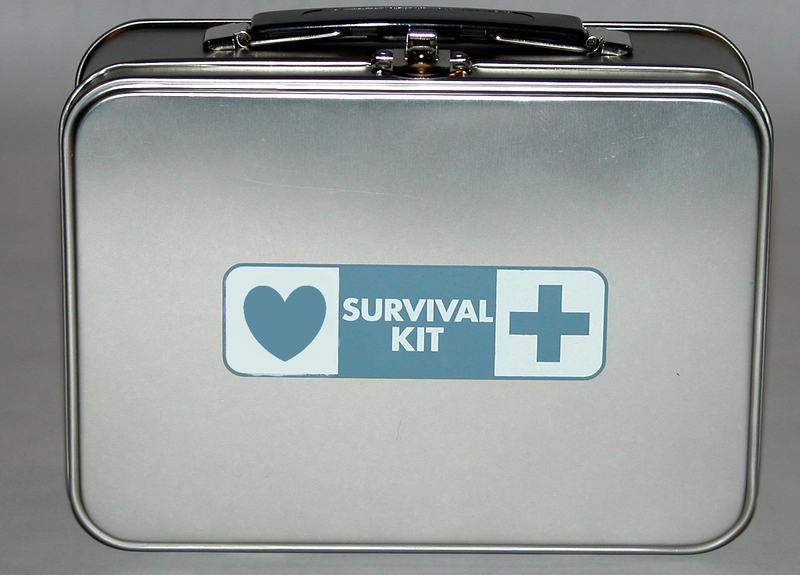 Are there other items you would include in a new manager’s survival kit? Feel free to share your thoughts by leaving a comment. Thank you Randy for your “Survival Kit.” It was so well stated, I passed it onto a newly appointed manager and aspiring leader. I appreciate contributions like yours to the business community–helps keep us focused on what matters. You’re welcome Cassie! I’m glad it’s helpful to your organization. Randy, What a great summary of these essentials! I loved reading your post! Thanks Kathy, I appreciate the feedback! Randy, Thank you for your great summary of these essentials! I loved reading your post! Re: #9. Have you already done such a post? If so, I’d love a link to it. Hi Penny. No, I haven’t done a blog post yet on inspirational reading but I think I will in the future! Great post Randy! Love your mix of humor and powerful points! Hearing aids and tissues were my favorite items on your list! Thanks Chery! I appreciate your feedback. Those are two of my favorites too! Pingback: 10 Essential Items for a New Manager’s Survival Kit | Bare Brilliance - We deliver the world's best business training. Online, with LIVE trainers. You’re welcome Sophia! I hope it will be beneficial to your team. Loved the post, great timing for new Sales managers. However, you cannont start a fire with a mirror, instead you need a magnifying lens.